I am an expert at praying but not on prayer. “The LORD says: “My thoughts and my ways are not like yours. Just as the heavens are higher than the earth, my thoughts and my ways are higher than yours.’” (Isaiah 55:8-9 CEV) Because I am a user of prayer and God is also a user of prayer it is (at least for me) an unsolvable mystery and because I don’t understand all the “God prayer factors” I am an expert at praying and a student at prayer itself. And perhaps the following quote stands at the top of the list. As you can no doubt see Jesus used grape to help people go deeper in their understanding of spiritual “things” they might otherwise have a difficult time understanding. 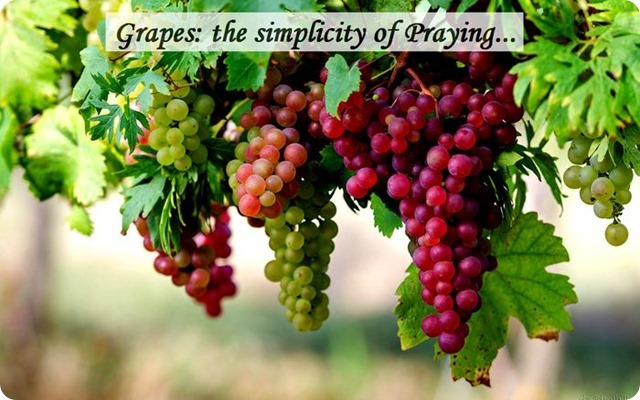 The other morning during my devotional time which was centering around praying and prayer the Holy Spirit suggested to me that a simple model of understanding the deeper elements/factors/steps of prayer could be achieved by using grapes as symbols. And with the help of the Spirit I was able to use the letters comprising grapes as an outline of the elements/process of prayer. Here’s what we come up with: Gratitude, Refocusing, Adoration, Petitioning, Expecting, Sensitivity. R… While the life we live is ours and no one can live it for us life is not only about us. Even if he lived in a world of one it still would not be only about us because God will always be a part of our lives no matter where life takes us. It is easy when life becomes difficult for the focus of our lives to shift from God to ourselves and when the focus os shift life not only becomes more difficult it also becomes more complicated. One of the most powerful lessons about keeping the focus of our lives on God is taken from what happened to the disciples on a stormy night at sea. A…There’s a fine line dividing gratitude and adoration. As I understand each of them gratitude is expression of being thankful while adoration is a response of worshiping. Perhaps it is difficult to understand praying as a worship experience but the truth is praying is one of the most intimate of all worship experiences because even if we’re involved in praying in a public setting it is not only a corporate experience but an individual experience as well. Moses makes a point of the relationship between worship and prayer. E… Expecting God to answer our prayer may sound like a “no brain-er” because who starts out praying, “God I know you’re not going to answer me but just in case you decide to I am going to ask you anyway…” But the truth is there are more subtle ways of not praying without expectation. Setting the record straight God drops this promise in chapter 29 of Jeremiah. S…Expecting’s first cousin” is Sensitivity. Some time ago a television ad for a Wall Street Brokerage firm (if my memory serves me right) went something like this. “When ______________ speaks people listen.” That may be true of that firm (I always listened to the ad anyway) but that may not always be true with God. As powerful as God is there are times when the power to hear God may reside with us. Take for instance Elijah’s experience with God. As I stated earlier I am a expert at praying and a student at prayer. What follows over the next 6 weeks or so is a written record of the elements/factors/steps I’ve experienced at praying at least 55 years out of my 69 years of life, lessons gleaned from my study of the bible, and insight gathered from listening to others as they’ve prayed. One of the most important lessons I’ve learned (the hard way at times) has been just when you think you know all you need to know God gets out his eraser and goes to work then you find yourself not starting over from scratch but getting restarted where you left off. And so with those thoughts embedded in our minds and hearts lets move more deeply in the simplicity of prayer.